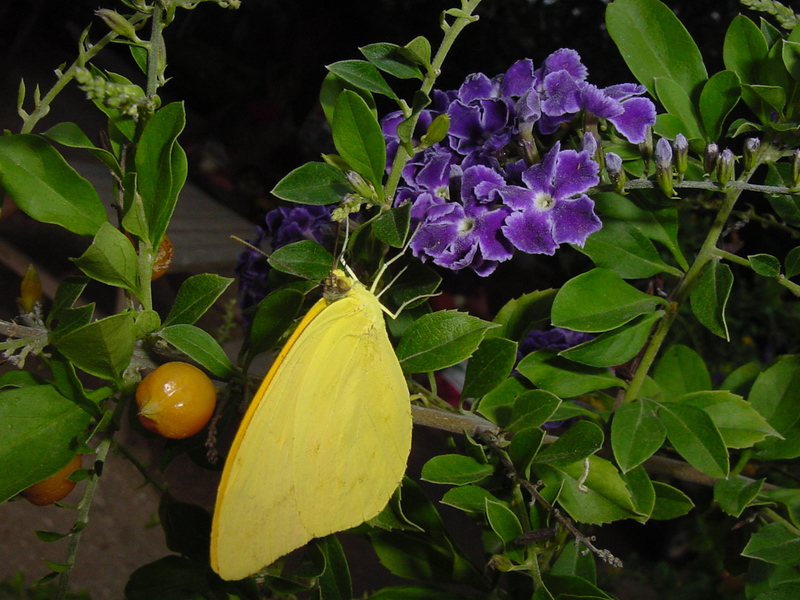 Duranta with Sulphur butterfly on flower and fruit. A. Variegated Duranta before the deer came. B. Variegated Duranta 'Gold Edge' after the deer came. Two Tx SuperStars for 06--Variegated Duranta and Henry Dulberg Salvia. 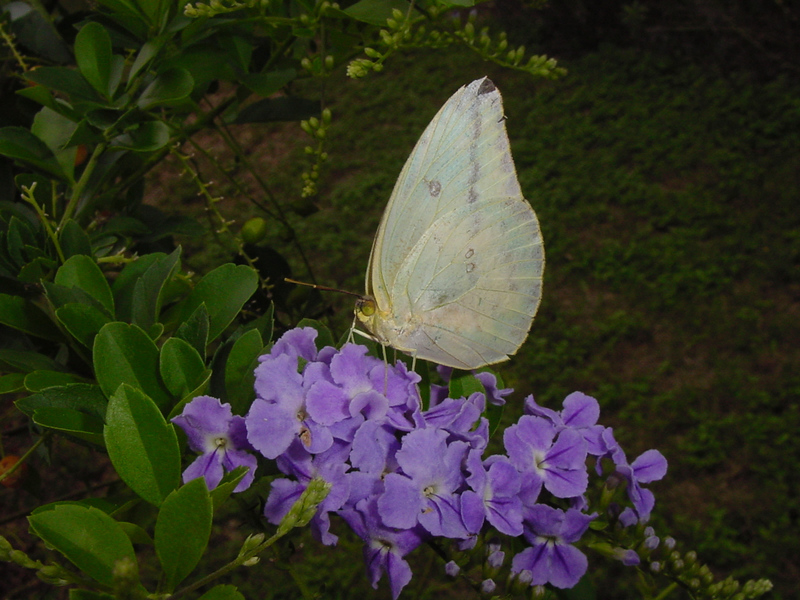 The genus Duranta L. contains 17 to 30 species of tropical trees and shrubs; some are regionally cultivated as ornamentals. 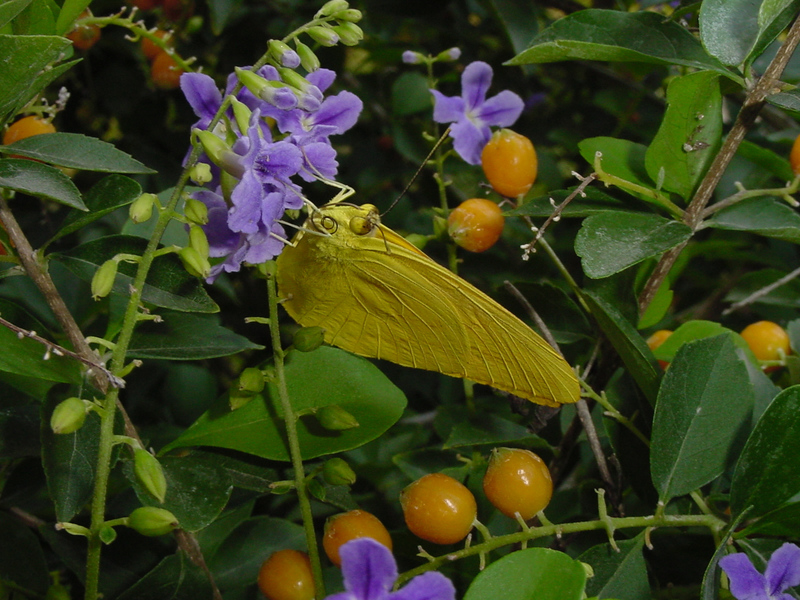 The Duranta we have accepted is Duranta erecta commonly called Lilac-Flowered Golden Dewdrop, Brazilian Sky Flower, Duranta, Pigeon Berry, or Sky Flower. It is a rapidly growing type having dense, somewhat evergreen, foliage and lilac colored flowers. Renewal pruning is needed occasionally to maintain a dense manageable form. 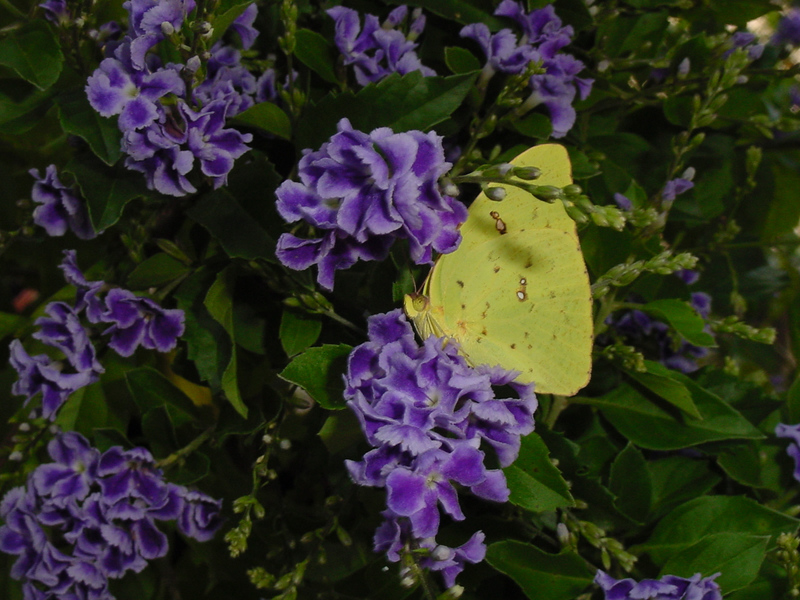 A yellow foliage variegated form named Duranta 'Gold Edge' is available. Its brightly glowing gold and green variegated foliage provides a strong contrast, especially with red tones. This variety rarely blooms or sets fruit. Durantas have the ability to tolerate sun or shade. 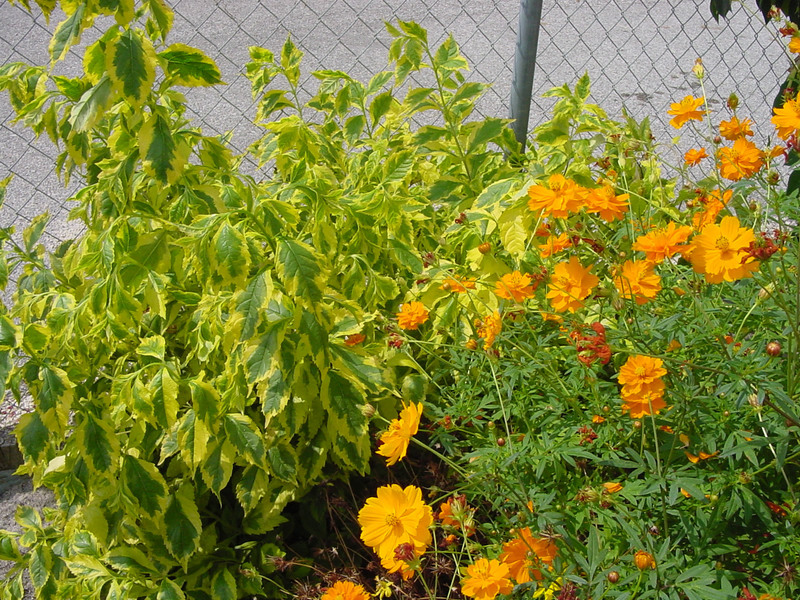 Obviously the blooming Durantas perform best with more light but the variegated ones such as 'Gold Edge' actually look best in partial shade. Since 'Gold Edge' is used for its foliage display, blooming is not important. (1) It must be attractive and useful to the gardening masses ratherthan a special few who devote themselves to one specific plant type. It is described in described in Ornamental Plants For the Rio Grande Valley as: "Very desirable. (Verbenaceae) Large, evergreen shrub that produces graceful, drooping branches, a few thorns, bright green ovate leaves and numerous small flowers throughout the year. 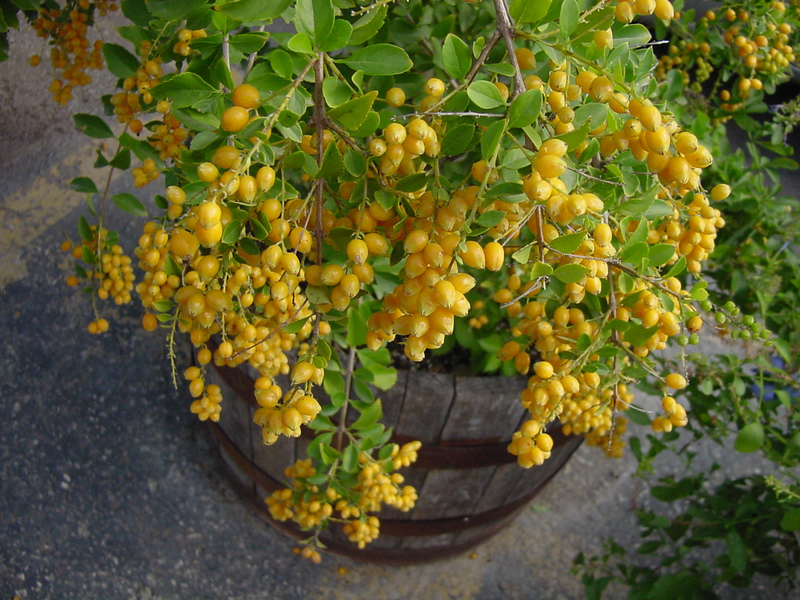 Flowering is continuous in the tropics, but begins in late summer and continues through autumn in less tropical regions and is followed by numerous, small, golden "balls." The fruit is elongated spherical to teardrop shaped drupes; three-eights to one-half inch long. 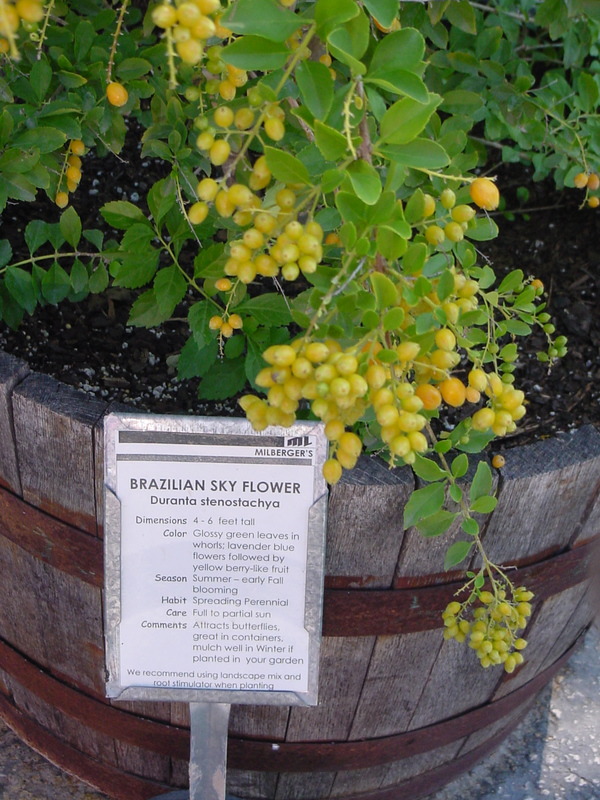 The fruits are initially green and then mature to a golden yellow to yellow-orange color. 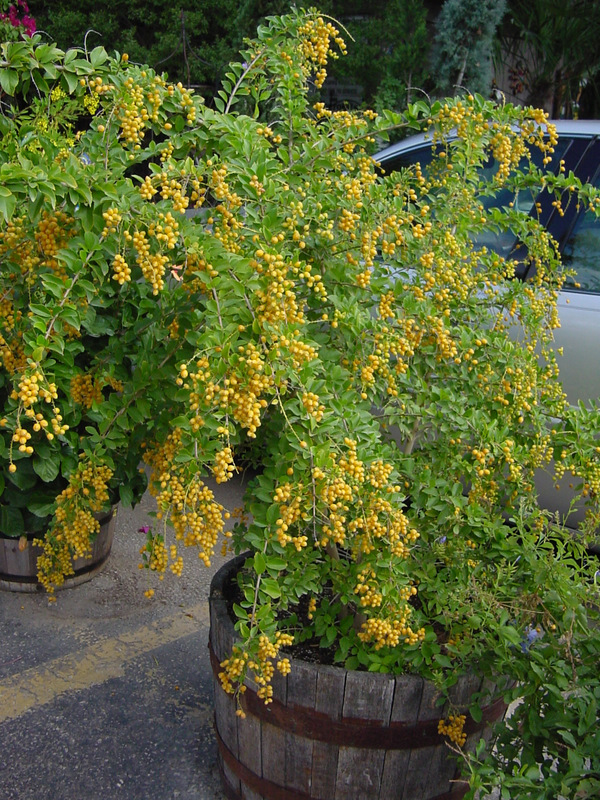 It can be commonly used as a summer annual for late season color or perhaps in patio containers. It will be a perennial planting in zone 9, along the coast or in deep South Texas in shrub borders. 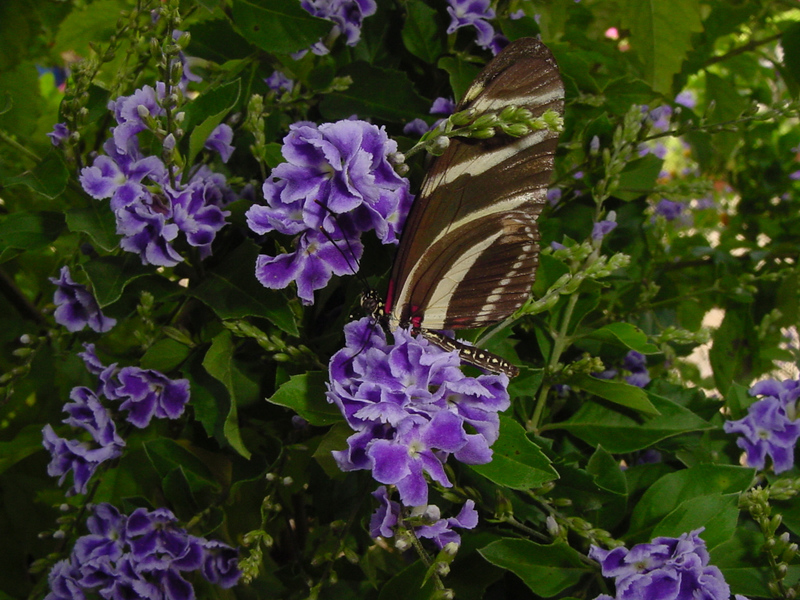 ; Duranta attracts birds which feed on the fruits and it is one of the few flowers that attract both hummingbirds and butterflies. Other great features of Durantas are their ability to tolerate sun or shade and their actual preference for heavy soils. (2) It must be unique and/or offer desirable and ornamental characteristics which are not usually available in commonly sold plants. 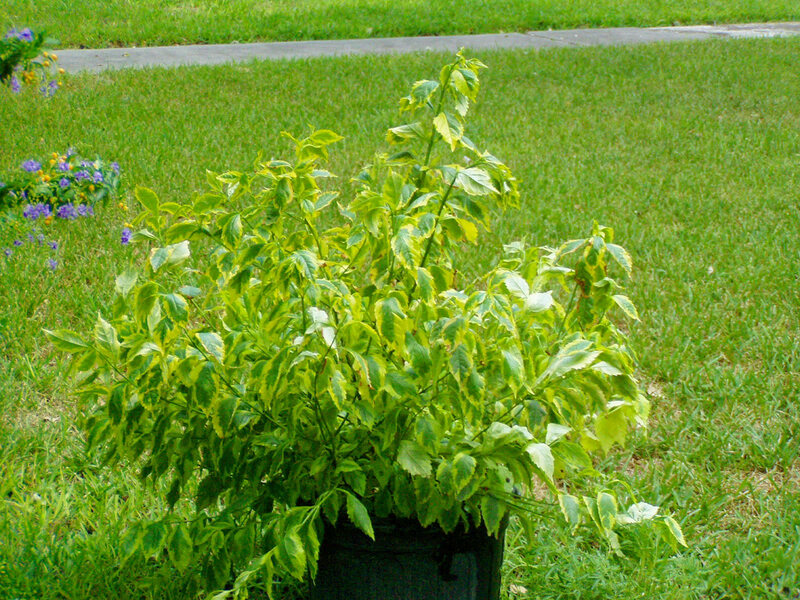 Durantas as described in Native Shrubs for South Florida at http://edis.ifas.ufl.edu/EH159, have a mature natural height of 12-15 feet; a growth rate of medium; a wide soil pH range (does well in acid or alkaline); a hardiness zone from subtropical to tropical; require medium to high light exposure; have medium salt tolerance and drought tolerance; nutritional levels are low but needs a well drained soil; plants can become chlorotic in poor fertility sites. (3) It must consistently perform well for Texas consumers regardless of their plant growing expertise and their growing location. Because of the harsh and changeable climate in Texas we sometimes use perennials as annuals and woody plants as perennials. For instance, Vitex is considered a small tree but in North Texas, it freezes to the ground and it a root-hardy perennial. In places where it does not freeze to the ground, the Texas SuperStar growing scheme recommends it be cut to the ground every spring and grown as a multi-trunk shrub. This enables the easy removal of seed stalks. We also like to find and recommend root-hardy tropical plants as perennials, or even annuals, in some parts of the state. For instance, Duranta is hardy as a subtropical shrub or tree and develops into an irregular spreading large shrub or small tree 15 to 20 feet tall in USDA zones 10 and 11; it serves as a 6 to 8 foot tall summer annual, herbaceous perennial or dieback shrub depending upon the severity of winter temperatures in zone 9; or as a summer annual in zones 8 and colder. 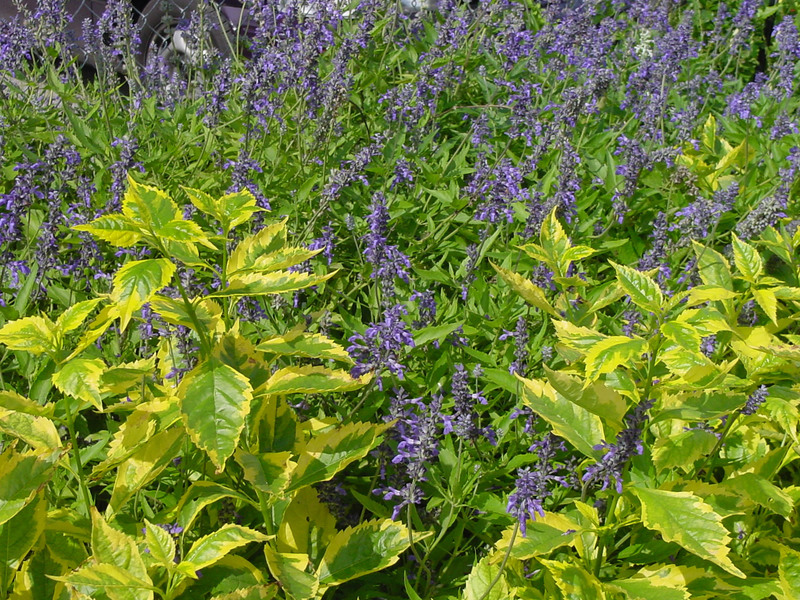 This is the case with other SuperStar plants such as Firebush (1990 - Hamelia patens); 'Goldstar' Esperanza (1999 - Tecoma stans); Plumbago (2005- Plumbago auriculata (P. capenis); and 'Texas Lilac' Vitex (2005 - Vitex agnus-castus). (4) It must be as pest resistant as possible. 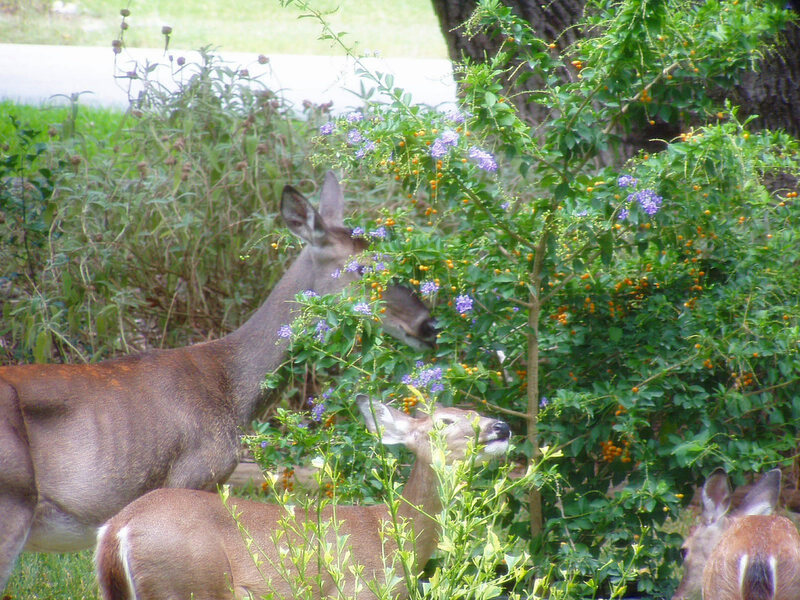 An added bonus is for it to be a deer non-preference plant. Durantas are somewhat resistant to disease and insect attack but scale insects, caterpillars, and nematodes can be occasional pests. In some literature, Duranta is described as having poisonous fruit containing hydrocyanic acid. 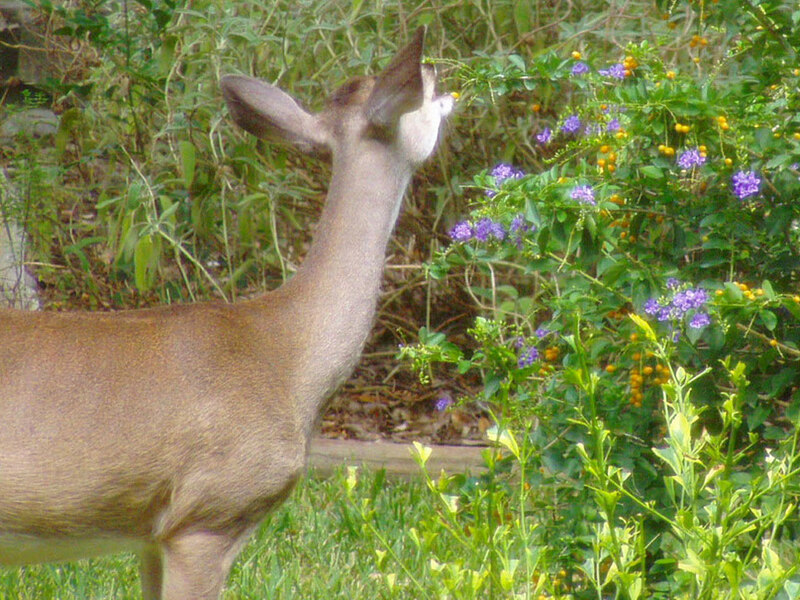 When put in an area densely populated with deer, all plants were eaten within three days with the berries being eaten first. No animals were killed, the meat presumably was not tainted, and the deer supposedly were worm-free for several months thereafter. (5) It must be able to be propagated and mass-produced in sufficient numbers to meet the increased consumer demand generated. It can be propagated by sowing the seed in the spring or from greenwood cuttings. (6) And most importantly, It must be so attractive in the sales container that it sells itself to the consumer who has never heard of the many attributes of the plant. Most cultivars of this species have a dark blue stripe in the center of each flower petal, but different selections may have darker or lighter flowers. Cutting-grown selections of this species include Duranta erecta 'Sky Blue', which has light blue flowers and a dense, compact habit; and Duranta erecta 'Royal Blue', which has dark blue flowers and is also very compact. This species is by far the heaviest berry producer, which enhances its value as an ornamental and bird attraction. I have a hard time remembering scientific names so when Duranta was recommended, tested and approved to be a 2006 Texas SuperStar Plant, I had to find a way to remember the name. At my age the solution was simple-think of Jimmy Durante! 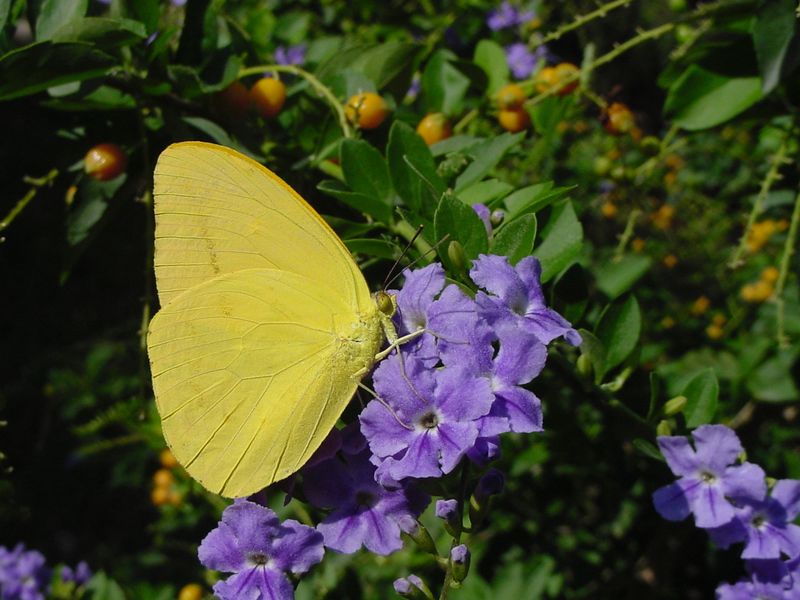 In fact, I tell folks that the Duranta was named after Jimmy Durante even though I think the plant is a bit older than Jimmy (Actually the genus name honors an Italian botanist and papal physician named Castore Durantes but who has ever heard of him?!?). So "Good Night, Mrs. Calabash, wherever you are"! 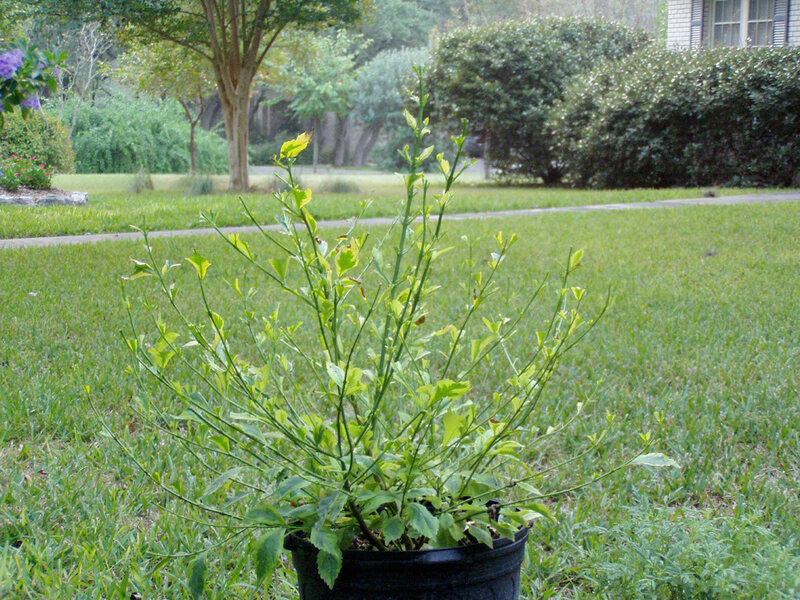 Nowadays, many gardeners want Texas' tough SuperStar plants that can fill their gardens or containers and live a long time without much maintenance. For something that is "old-yet-new", that is easy, and showy, why not try some Durantas in your garden?